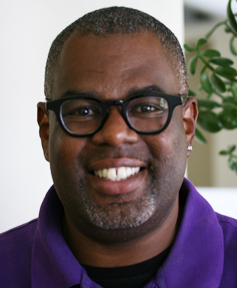 Dr. Terrance Kwame-Ross is an Associate Professor in the Education Department, Augsburg University. Terrance also holds a Visiting Faculty-Lecturer appointment, in the School of Social Work, Youth Development Leadership (YDL) Graduate Program, University of Minnesota. Dr. Kwame-Ross’ scholar research and practice focus on how humans learn, grow, and stay the same, over their life span. Terrance has taught at the elementary and middle-level grades in public schools, Co-founded and served as Principal and Director of New City School, in arts-infused academic and social-emotional integrated, Public Charter School, located in Northeast Minneapolis, Minnesota; Created community-base after-school programs for young people for creative self-expression; Served as a curriculum developer, trainer, and consultant to many formal and non-formal organizations locally and nationally; Worked in residential treatment programs and camping settings directing and facilitating multi-cultural programs for the Wilder Foundation, St. Paul, Mn. Consultant to local, state and national School Districts around policy, practice, and educational research. Terrance also was the Executive Director of The Origins Program, a nationally recognized non-for-profit equity training center for teachers.